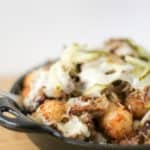 Cuban Totchos Nachos - Cuban Tater Tot Nachos with Homemade Pickles! Craving a Cuban sandwich? 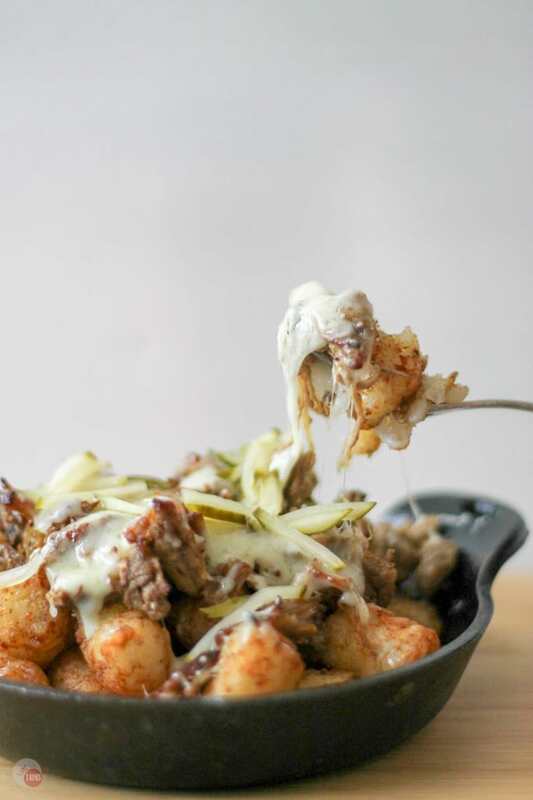 Try these snackable Cuban Totchos Nachos with all the pork, cheese, and homemade pickles you can stand! What goes into a Cuban Sandwich? Have you seen the movie Chef where a chef leaves a restaurant and opens a food truck, with the help of his son and a sous chef, and travels the country making the perfect Cuban sandwich? If not, you need to! Until then, grab a Cuban sandwich and dig in. What is in a Cuban Sandwich you might ask? There are regional variations of course, but these are the basics. All of these tasty things on grilled bread! Oh, and the butter on the bread as the key to the sandwich being top-notch. I want to recreate this sandwich but make it shareable. Not that a sandwich isn’t shareable per se, just more nacho finger food like. Instead of the usual tortilla chips, I’m beefing them up by using tater tots. When using tater tots, they can’t be called nachos anymore. They are officially called Cuban Totchos, and they make the flavors of the Cuban sandwich even more intense. To make a Cuban sandwich you need pork. Most people use pulled pork and sliced ham but I am not a huge fan of sliced ham on my sandwiches so I leave it off. This leaves room for more pork. Yes, ham is pork but I am talking about the slow roasted pulled pork. Plus, a large slice of ham doesn’t really go with finger food in my opinion. That is really more fork food and who has time for forks? Not this girl! For this recipe, we are sticking with pulled pork. 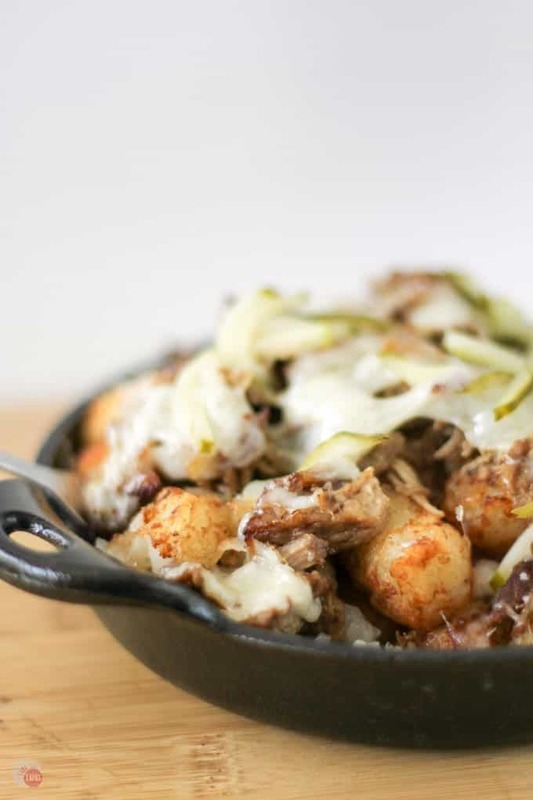 I love the citrus notes in my (Brooks’) pork carnitas so I thought using them would elevate the Cuban Totchos even more than plain pulled pork. The other important part of a Cuban sandwich is the pickle. The tartness of pickles is essential to rounding out the flavor profile and my Homemade Refrigerator Pickles are a perfect choice! All the ingredients are rich. 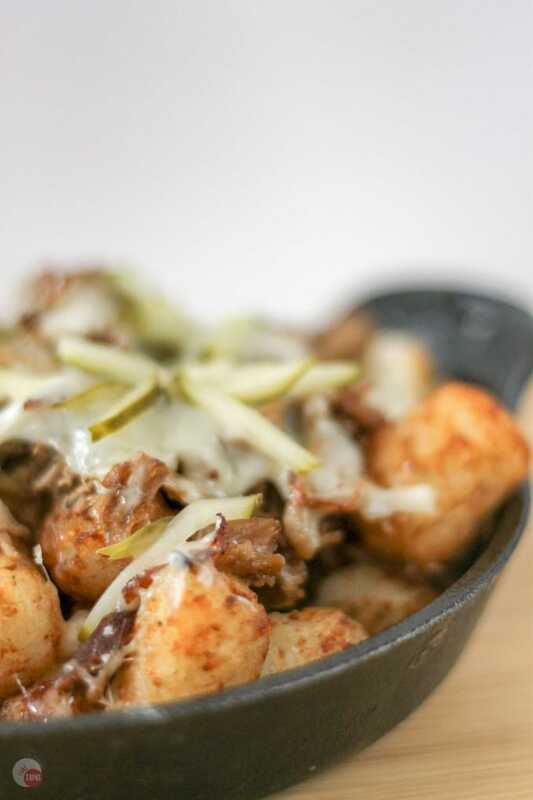 You have crispy tater tots, gooey cheese, and the fattiness of the pork carnitas so you need something bright to cut through it all. Big pickle slices don’t really work with finger foods so I slice mine very thin. This way you can grab onto each Cuban Totchos and also get a little cheese, pork, and pickle as it is pulled from the plate. June is the month of nachos on Take Two Tapas so I am calling these Cuban Totchos Nachos. I never heard of totchos until I was in Atlanta two years ago. On Sunday morning, after a night of too many cocktails, Brooks and I headed to Brunch. 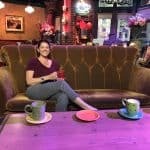 We found a great local spot that is famous for its Bloody Marys. Heading there for hair of the dog, we find that the most popular dish for Brunch was, in fact, tater tot nachos or “totchos.” Nachos made with tater tots instead of chips. It makes it heartier, more filling and contains that all important Vitamin G (grease) that you need after a night of too many drinks. 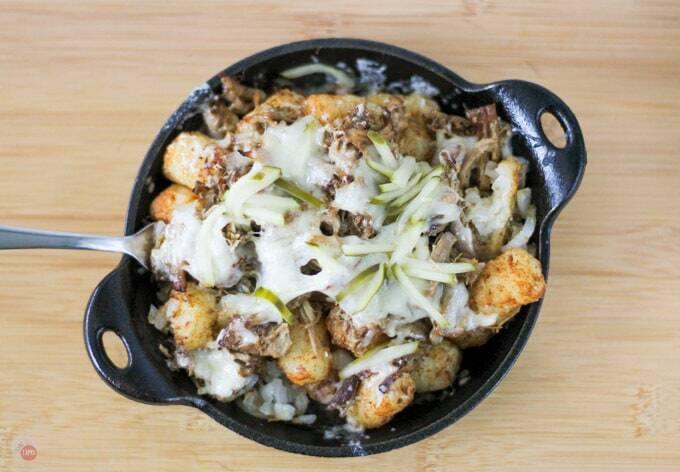 When thinking of what I was going to put my Cuban nachos on, there seemed to be nothing more perfect than tater tots! What is your favorite part of these Cuban Totchos Nachos? Mine has to be the pickles! Comment below and let me know! Place your warm tater tots in an oven-proof bowl. Bake at 350F for 5-10 minutes or until the cheese is melted. Remove from oven and top with pickle slices. I don’t care much for fries but have a weakness for tots!! Thanks for sharing with us at Throwback Thursday! Oh my gosh…these look so delicious that I’d probably eat the whole pan! Thanks so much for sharing your recipe at Share The Wealth Sunday! I have never heard of a recipe like this before – I’m totally curious because it sounds amazing!! Yum! These look and sound amazing. Thanks for sharing with us at Family Joy Blog Link Up Party this week. This dish looks fantastic! I am a big fan of anything pork! I am going to check out the movie Chef too! Sounds like a good movie! I love to watch The Great Food Truck Race so I’m sure I would enjoy Chef! Thank you so much for the feature of my Jalapeño Potato Salad! It was a great way to start my day!